Sample (long) from volume 1: “Summertime” Live at the BlackHawk. 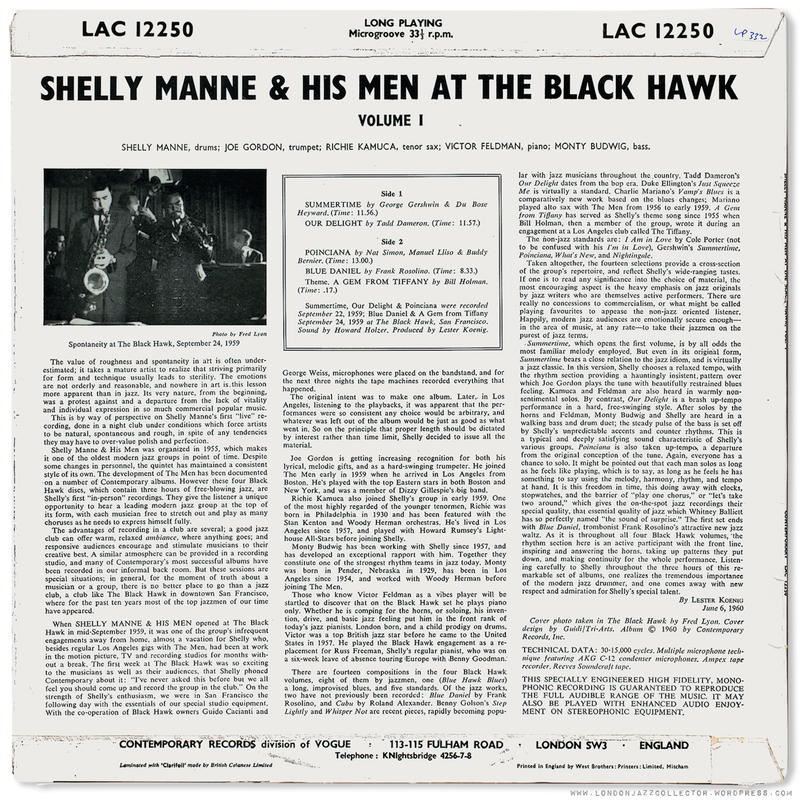 Being relatively new to West Coast jazz, a helpful steer from the Penguin Jazz Core Collection pointed me at Shelly Manne and his four volume “Live at the BlackHawk” . Recorded over successive evenings at the San Francisco premier jazz spot, the line up is a little unfamiliar, to me at least, but I it swings and I like it. Thinking of another band led by a drummer – Art Blakey – I was fearful of forty-minute drum solos but not a bit of it. Manne and his Men are as polished and cool a jazz quintet as you might find among New York’s finest, featuring Joe Gordon’s fine trumpet, a relatively unknown Richie Kamuca on tenor, and the very well known Victor Feldman – only this time only on piano and not vibraphone. Manne doesn’t grandstand, but he does push everything along nicely, supported by the full surefooted bass of Monty Budwig. The standout track is the Gershwin standard “Summertime”, delivered at a lush languorous pace reminiscent of Grant Green’s “Idle Moments” and Miles/ Adderley’s “Autumn Leaves”. Lots of space for the soloists to stretch out. Kamuka is no Joe Henderson or Julian Adderley, but to his credit he eschews the obvious tenor-running-on-speed, opting for a slower paced moody solo which you warm to on repeated listening. Feldman is superb – parallels with McCoy Tyner and for once the piano sounds like a real piano. For all of his total genius, master engineer Rudy Van Gelder never did find the knack of recording piano, at best sounding like being played under a thick layer of blankets. A very satisfying musical outing. Pressed here for first UK release in 1960 on Contemporary Vogue and as best I can tell, mono, though it is so full sounding it hardly matters, being an intimate club setting. And beautifully recorded – and as you might expect given the group leader, especially the crisp snare brushwork and cymbal rings. Nice dynamic range from high to low, and everything in between. One book that sounds like its cover looks. Volumes two, three and four all have bids sitting on them, so back off, they are mine! Nope, I haven’t bothered to collect the full four Shelly volumes. To be honest, there is another Live Blackhawk session which I valued much more – Miles Davis In Person Friday and Saturday Night at The Blackhawk, Hank Mobley! stretched out over six LPs in a Mosaic box set. Mobley stretching out and not edited down to fit on the two Columbia LPs. Remarkable live performance. 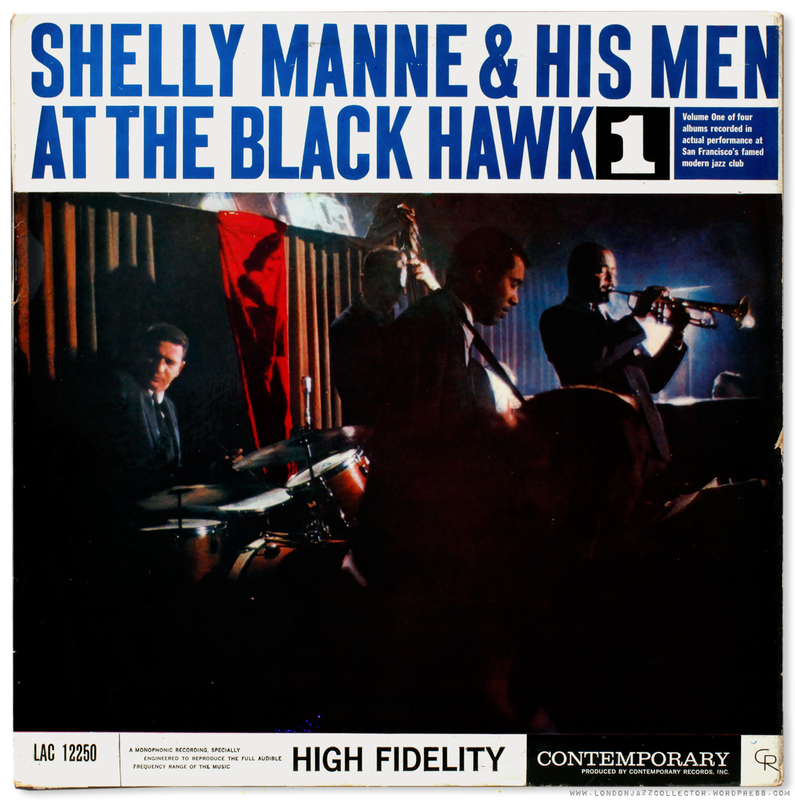 This entry was posted in Contemporary, Shelly Manne, West Coast and tagged Blackhawk, Jazz, Richie Kamuca, Shelly Manne, Victor Feldman, Vinyl by LondonJazzCollector. Bookmark the permalink. Live performance is often much more self-indulgent with time, but the audience is usually happy with the total experience. It has a different ambience compared with a tightly scheduled studio date, the meter running, ten takes to get it right. I like live club sessions, where you can turn the lights down low and join the audience. Perhaps Mr Wilson was looking for something else. However I also note that I haven’t felt motivated to collect all four volumes, so maybe he has a point. No no, he was definitely talking about the first volume. However I found another DB review written by Ira Gitler about a month later, in which that same record (Vol. 1) was awarded four stars! Rightly so, IMHO. BTW, all four volumes are equally excellent. So is “Vol. 5” (Cont. 7580) which was added many years later, containing material from the same sessions. Leaving the quality of the music and musicians aside, where obviously Blue Note is beyond criticism, Contemporary LP’s sound more natural and the instruments have a fuller tonality and timbre than many Blue Note records from the same period. That’s exactly what I think. RVG notwithstanding, Roy DuNann is King in terms of perfection and sheer beauty of sound. No one was able to record the bass drum and cymbals the way he did. 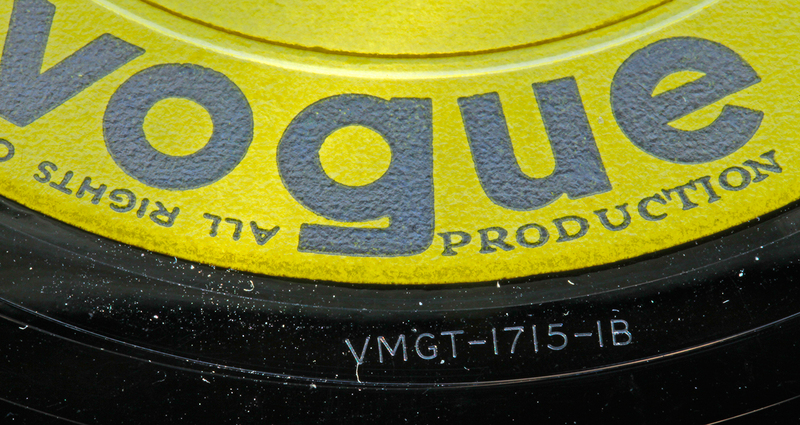 I am not sure how accurate this site is, does not list Vogue at all [http://www.vinylbeat.com/cgi-bin/labelfocus.cgi?label=CONTEMPORARY&label_section=A,B,C], but it claims the yellow-label stereo (which I have) is a 60’s era reissue, yet the deadwax is confounding, listing SLM (likely Sheffield Lab Matrix), which did not exist until 1979? The band name and album title in the middle of the label are in a bold ALL-CAP font, unlike the others. So, pretty sure I have a 60s reissue set and that somehow Vol 3 has the different font on the label which is consistent with the 1970s labels, but the wrong color, and the stamped vs etched on Vol 2. #4 has CONTEMPORARY S 7580 with STEREOPHONIC underneath, and has CR logo top left, and is the only one with a section across the top describing stereophonic, as if it were new then, so perhaps an older pressing? I think I have a wacky mismatched set of volumes / reissues. Joe Gordon is the real stealer here. This is easily one of the best renditions of Summertime, I’ve ever heard. How great Gordon could have become. Nice album. I think that a lot of these titles on Contemporary are really underrated. Hear hear. You can pick up originals of these at £15-£30 depending on title, and mostly they sound stunning. Not as collectible as Blue Note but in better supply. The numbers are growing. The only drawback is the large number of reissues of Contemporary that look virtually identical. 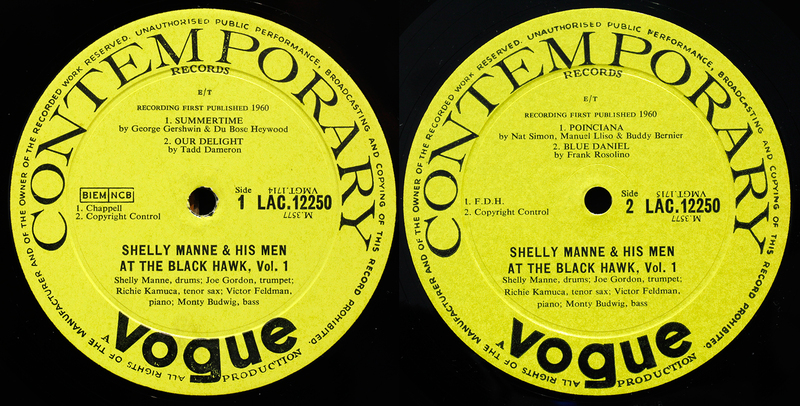 Then there are the US Originals (Contemporary Records) vs UK Originals (Contemporary Vogue). And the Mono vs Stereo argument. I am working towards a means of definitive attribution.The answer I think is in the runout.